Clarinetist David Odom and pianist Jeremy Samolesky enter what is rapidly becoming a crowded field with their new recording of the Reger clarinet sonatas. ArkivMusic lists eight recordings of the First Sonata, four of which from the last two years. The composer’s centenary celebrations may have contributed, but an equally significant factor seems to be the discovery of this music by American clarinetists, or perhaps newfound opportunities they have for recording them. This new version is close in spirit, and in duration, to the Alan R. Kay/Jon Klibonoff recording on Bridge (9461), which was the subject of a Fanfare interview in 40:2. Kay and Odom both opt for slow tempos. Kay explained in the interview that he was following Reger’s tempo markings, and that the tendency for faster readings is a result of Reger’s long phrases and the difficulty of supporting the line. Odom and Samolesky are presumably also faithful to Reger, and their versions are slower still, though not by much, around a minute in each sonata. Even so, this makes them, I think, the slowest on record, with the notable exception of the glacial Janet Hill and Jakob Fichert on Naxos 8.572173. The best of these new readings comes in the slow music, and David Odom finds valuable breadth in his slower tempos, always able to sustain the line and, with Samolesky, create a warm and luxuriant atmosphere. It is occasionally too luxuriant though, and the sense of direction (always there in Reger, whatever his detractors say) requires greater concentration from the listener to follow. The faster music is less successful. Phrases are not shaped adequately, and cadences lack urgency. The sound quality is good, but not exceptional. The piano sounds recessed, giving it a rounded sonic profile: good for atmosphere, but poor on detail. Odom has a beautifully rich tone in the lower register, which the audio picks up well, but a thinner tone at the top, for which the recording does no favors at all. The most radical aspect of this recording is the running order, with the Third Sonata, op. 107, placed first. That is a great idea, and a daring one too. The Third is less immediately attractive than either of the first two, and it takes longer to warm too. 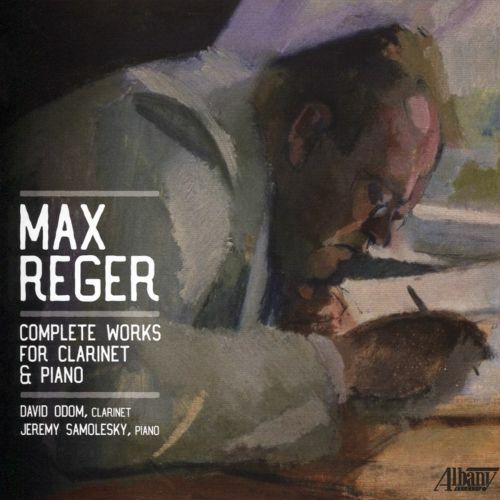 It is in Reger’s late, more harmonically direct, style, but expressively it is the most complex of the series. It usually languishes in third place on disc (apart from on the otherwise excellent Florent Héau/Patrick Zyganowski recording, Zig-Zag 090303, which omits it altogether) and so the listener is obliged to consider it an appendix to the more stylistically interconnected first two. But hearing it first gives the piece a new lease of life: Here, it is not an answer to anything, but a bold, independent statement, even if its sentiments are mostly inward looking and nostalgic. On the subject of running orders, Odom and Samolesky don’t seem quite sure what to do with the Albumblatt and Taranetella, the two short additions required to justify the Complete Works for Clarinet & Piano of the album’s title. Placing them at the end makes them into an afterthought, an impression confirmed by the performances, which, at each around the two-minute mark, probably are the slowest on record. Sadly, that only reinforces the impression given by the whole disc of needless languor in music that, while atmospheric, often needs more impetus than it gets here. Franz Schreker enjoys a modest but enduring reputation in the opera houses of the German-speaking world, and appearances of his music on disc follow suit—occasional but not uncommon, and mostly from Germany. So this Swedish recording of orchestral excerpts is a welcome exception. It’s an impressive disc, the selections presenting the composer at his finest, and all performed with precision and feeling, and recorded at the high standards associated with the BIS label, still laudably loyal to the SACD format. 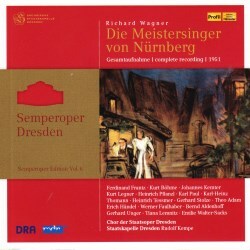 The five tracks all relate to separate operas, in the case of the Vorspiel zu einer grossen Oper, to an unrealized opera project about the Egyptian god Memnon. The feeling throughout is of operatic drama, Wagnerian in spirit through often with a light, lyrical touch that suggests a French influence (a chord sequence in the Das Spielwerk Prelude sounds identical to the sunrise in Daphnis et Chloé, with which it is almost exactly contemporary). But the program also works well as a series of standalone works, and all were arranged as such by the composer, so there are no bleeding chunks. 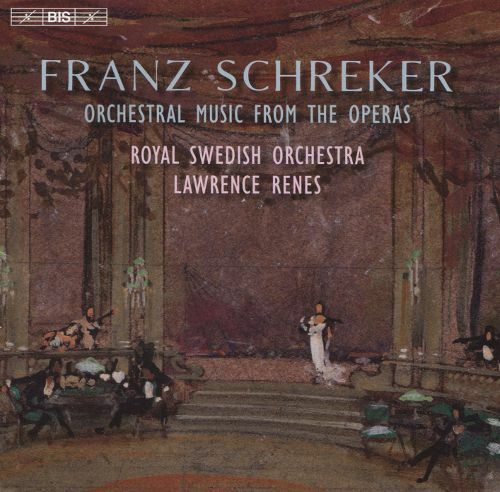 Lawrence Renes and Royal Swedish Orchestra do a fine job with Schreker’s music. The performances feel more disciplined than in Schreker recordings of the past, but no less passionate for it. A little more bravura from the brass, especially the trumpets, might have added to the climaxes, and a case could also be made for more warmth from the strings, but both are minor complaints. All of these works, apart from the Die Gezeichneten Prelude, also appear on two recordings from Vassily Sinaisky and the BBC Philharmonic on Chandos (9797 and 9951), both of which were well received when released in 2000 and 2001. 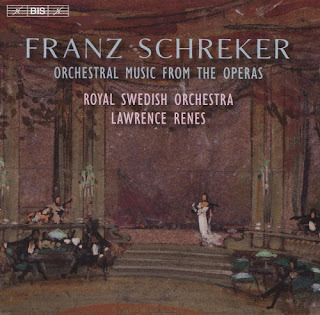 But this new recording stands up well on its own merits: welcome indulgences in Schreker’s expertly crafted orchestral sound world, and tantalizing tasters for his full operas, most of which are also well served by recent recordings.